Join us this month as we focus on iOS and some of the known and hidden Accessibility features Apple has built into your iPhone and iPad devices. You may be using some of thefeatures and not even aware of it. 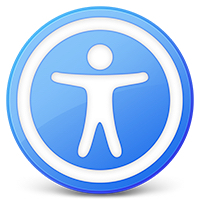 We will also take a look at some apps related to accessibility that make your overall iOS experience better. Join us to learn more about Photos and the best way to manage your collection. We will take a look at the Apple Photos App on both the Mac and iOS devices. We will explore online services such as iCloud Photo Library, Google Photos and Prime Photos from Amazon. As always we will be available to answer all your Apple related questions at the beginning of the meeting. Because we have a conflict with the most romantic night of the year we are offering a virtual meeting that you can attend at your convenience. Last fall Rick did a salon for Akaku Upstairs television about the iPhone. To see other great videos from Akaku Upstairs click here. Since we won’t be available in person to answer questions please email them to info@mauimac.org and we will provide a link to the answer. 2018 Membership dues have begun. Click the ticket in the right sidebar to pay your membership dues online. 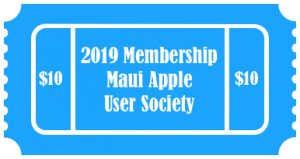 The Spring 2018 Apple classes at EdVenture UH Maui College are beginning. These are non-credit classes and open to the public to pay and sign up for. Classes include macOS, iPhone, iPad, iCloud, Photos, and iMovie classes. You can find more information and register for a class at their website: EdVenture UH Maui College. Throughout our daily technology use, we get request to update software. Sometimes, it creates issues, delays, and struggles. Join us this month as we help you understand these updates and upgrades, how to tame them, when to do them, and if you should do them. As always we will save time to take your iOS and Mac questions at the beginning of the meeting. Annual Holiday Potluck, Prizes and Swag! Join us for our annual celebration. It’s our social event of the year! Over $250 worth of door prizes. Please bring a dish to share (remember utensils). We will also talk about some gift ideas for the holiday season. As always we will save time to take your iOS and Mac questions at the beginning of the meeting.